From 1992 to 1996, whilst a part-time printmaking lecturer and technician at Northern Territory University (NTU), Gohier collaborated with George Watts and Leon Stainer in a series of pioneering printmaking workshops with Aboriginal artists in remote communities. This led to the establishment of the NTU Aboriginal Print Workshop, later to become Northern Editions. In 1996, Gohier became the inaugural art co-ordinator of the ‘Inside Art Out’ pilot project for Indigenous prisoners at Berrimah Prison, Darwin. By 1998, the venture had become an official prison program and was later extended to Alice Springs. In 1996, Gohier and Shaun Poustie co-founded Red Hand Prints, an open access space for community organisations to learn printmaking skills. Red Hand Prints also published many of the iconic political and social posters of this era. Gohier holds a Bachelor of Arts, NTU (1992) with a major in Fine Arts. 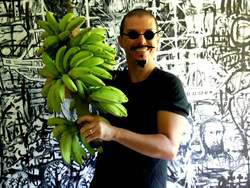 Since graduating in 1992, his work has been regularly exhibited in group exhibitions and solo shows throughout Australia and abroad. Charles Darwin University, Casuarina Campus, Darwin, N.T. Charles Sturt University, Wagga Wagga, Victoria. * Numerous works in private collections including , Australia, New Zealand, China, Hong Kong, Argentina, France,Germany and USA.